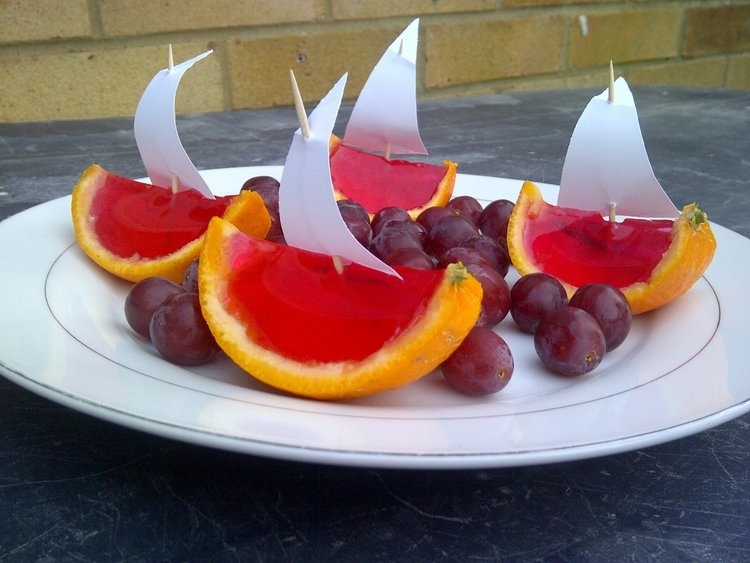 A fun addition to any kids’ party table, these jelly boats are sure to please! Package/s of Jelly, any flavour (And that’s ‘jelly’ as in the British use of the word jelly. So Jell-o gelatin or Jello, or whatever you might call it where you are). NOTE. Depending on the size of the oranges, the approximate ratio is 4 oranges to 1 pint (570ml) liquid jelly/jello. Cocktail sticks and paper to make sails. 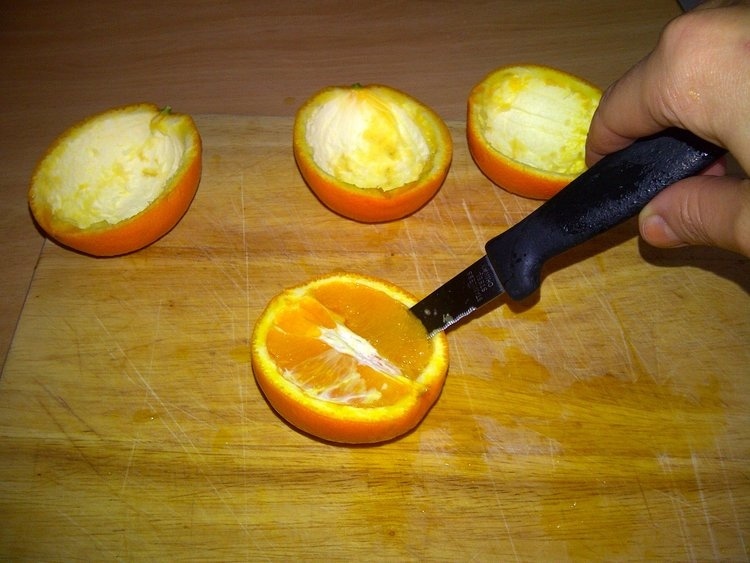 1) Slice oranges in half and remove the flesh. Take care not to damage the orange peel casings. I used a paring knife to cut around the edge against the peel, and then a spoon to remove the orange segments. You only need the peel for this recipe, so you’ll need to think of something else to use the orange flesh itself for. 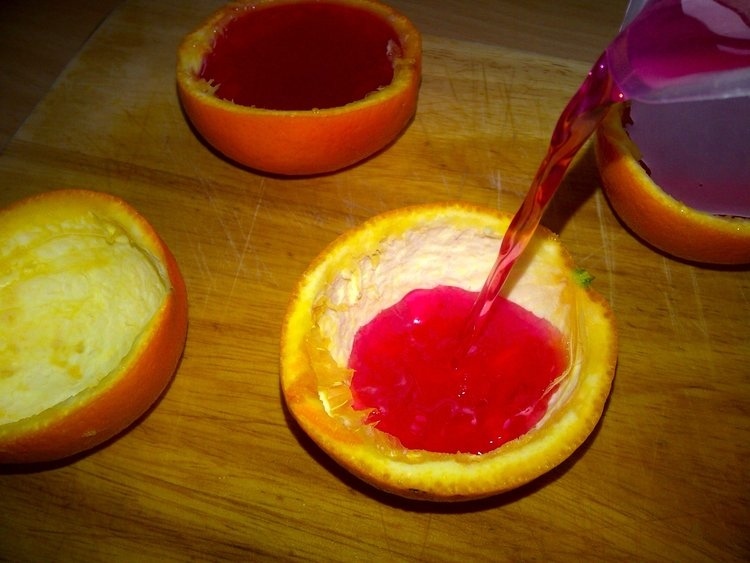 2) Mix up jelly/jello according to pack instructions and pour into the orange peel halves. You may need to stand the halves on top of egg cups or glasses if they are tilting so that you can fill them evenly to the top. Refrigerate until set. 3) Cut triangles out of paper and thread cocktail sticks through to make the sails. I’ve just used white paper, but you could decorate the sails to coordinate them with your party theme. 4) Once jelly/jello is set, cut each half in half again. I find a good finely serrated knife is best to saw through the peel. 5) Insert the cocktail stick sails into the boats. As long as your oranges aren’t too large, the tip of the cocktail stick should just be able to penetrate the peel under the jelly which will help to keep the sail steady. 6) Present them on a sea of fruit. I’m probably stating the obvious here, but just in case…if you’re serving these to young children, it’s probably a good idea to take the cocktail stick sails away at the moment they start taking the boats onto their plates. Oh those look so fun! I love ingenious uses of fruit like this. 😀 Wish I’d had these at parties when I was a kid! Yes, they’re a good way to encourage kids to eat some fruit at the party too, you could in fact place them on top of a whole fruit salad couldn’t you! Even at an adult party that would be quite a fun thing to do. Very clever. Would be great for the school picnic. Yes, they kind of are more of a summer outdoorsy thing. The light really goes through the jelly much better than when it’s in a bowl, so they look really bright and colourful outdoors. I must say, I enjoyed eating these ones I made just as much as the kids did! The jelly really clings well to the inside of the orange peel, it doesn’t slide off when you’re trying to eat it, and the flavour of the orange permeates the jelly, so you kind of feel like you’re eating very unusual orange quarters! Looking mighty tasty. Them that can, does, and them that cannot, follow. That’s me. Congratulations. This is so clever and cute! I probably would have eaten more fruit if it had been presented to me this way. And if you did put them on top of a whole fruit salad then you’d have a place for the orange flesh too! Yes, if you just put some plain fruit on a party table a lot of kids might not go for it, but if it’s presented in a fun way, they’re much more likely to! And you’re right a fruit salad would be perfect place for the orange flesh. OMG I want to try these! Seriously, what a cool idea! Do it! Even if there aren’t any children around to use as an excuse!